iWaterPRO™ is King Lee’s new, innovative web application for reverse osmosis system management. iWaterPRO™ graphs long-term trends and gives you system diagnostics, notifications, and recommendations to help maximize the life of your membranes. "Gain insight into individual train performance, flag potential problems." See all RO systems and sites at a glance on one centralized dashboard. Individual health gauges immediately let the user know current overall status of each system. "Flexible and simple data entry allows users to choose from single-day entry or multiday entry, or to upload data with an excel template." Allows for easy offline or online data entry and viewing 24/7. Web-based and available anywhere via the internet. 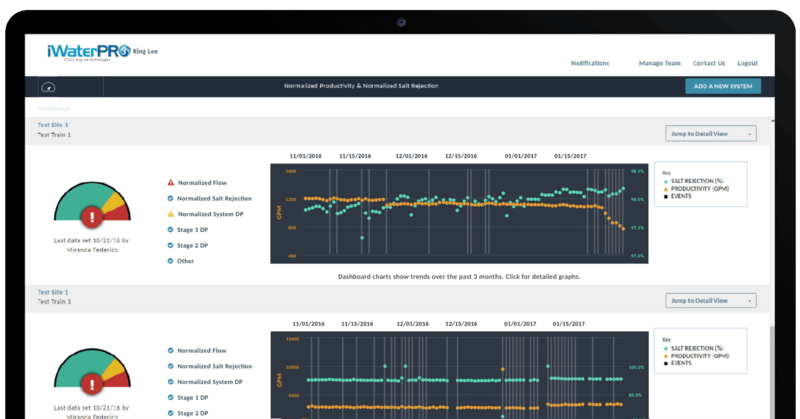 "Easily locate system problems by investigating operating data and any flagged alerts." Notification center provides a centralized and organized place for alerts and recommendations. Event markers show specific problem spots on trend charts. "Mobile app enabled for access to data and data interpretation/recommendations anytime and anywhere to give a universal standard for communication between team members and with consultants." Choose specific date ranges and parameters to view. All data is encrypted and stored in the Cloud. "The iWaterPRO is yet another demonstration of King Lee Technologies’ commitment to innovation and our continued heritage as the leader in membrane chemistry." Direct link between the customer and King Lee Technologies allows for quick communication and problem solving. Interactive and customizable graphs give the user a complete picture of each system’s performance. (e.g. view only normalized productivity, hide event markers, etc.). Website and Mobile app allows for easy data entry and viewing anytime, anywhere. Flexible and simple data entry allows users to enter data at their own pace. Choose from single-day entry or multi-day entry, or upload large amounts of data at once by using a downloadable excel template. 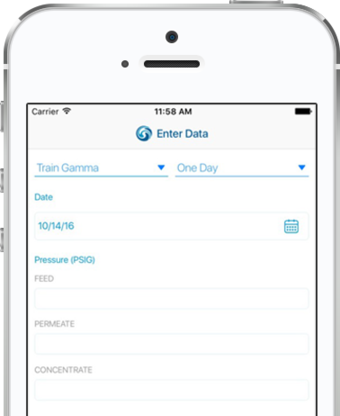 With security in mind, iWaterPro™ features secure login with Touch ID, all data is encrypted and stored in the Cloud. Optimize pretreatment chemicals and membrane selection. Reduce operating costs by extending membrane life.